Thou art my confidence from my youth." “The Moses Project” began in 1996 on a week long medical mission trip to the jungles of the Amazon near the city of Manaus in Northern Brazil. Dr. Michael Good from Springfield, Missouri, and missionary John Mark Bellington met a 3 year old Brazilian boy, Moses, who was brought by his mother to their make-shift clinic for care and help. Most patients seen in this clinic were treated for cuts, coughs, and worms, but this mother explained that her son had a different type of problem, a rare condition later discovered to be a rectal atresia. When she removed the cloth covering his abdomen, it became evident very quickly that this was a serious situation. She explained that Moses was born without a connection of the intestinal tract to the outside of his body. When he was three days old, she had taken him to a military hospital where a colostomy was performed. However, a few months later, the colostomy herniated and left a large segment of intestine on the outside of his abdominal wall. The fact that his mother was able to keep him alive in the conditions they lived in – no running water, dirt floors – was a miracle. Neither Dr. Good nor John Mark Bellington had been involved in this type of undertaking before, but they worked well together. Dr. Good began making contacts to find the best medical help for Moses, and John Mark began the process of legal paperwork as well as getting others involved with the expenses of this project. After much prayer and research, it was determined that the best course of action would be to bring Moses to New York for treatment. Documents and passports were finally obtained, and Moses, his mother, and baby sister made the trip. Dr. Peña of Long Island Jewish Hospital performed a series of surgeries on Moses to correct his life-threatening condition. Many individuals and organizations participated together. Dr. Peña and his staff donated their services. Moses’ family was able to stay at the Ronald McDonald House of Long Island. John Mark Bellington traveled with them as translator, facilitator, and friend. Many generous supporters across the country contributed to the successful treatment of Moses. Over 25,000 dollars were raised in a three month time period to cover hospital expenses and traveling expenses. Truly, the Lord was faithful. 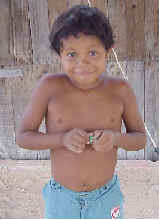 Three months after arriving in New York, Moses returned home to Brazil as a normal little boy. Today, he still lives with his parents and four sisters in the outskirts of Manaus. He is able to run and play, attend school, and live as a healthy little boy. We are grateful to God for answered prayer concerning Moses. As the years have passed, the Lord has brought more Brazilian children with significant needs to our attention. Thanks to the generosity of numerous doctors, hospitals, airlines, and volunteers across the country, these children and their families are receiving long-awaited medical care and now are able to face the future with a new hopeful outlook. By the grace of God, “The Moses Project” is touching children, their families, and their poor communities in Brazil for Christ and His gospel.